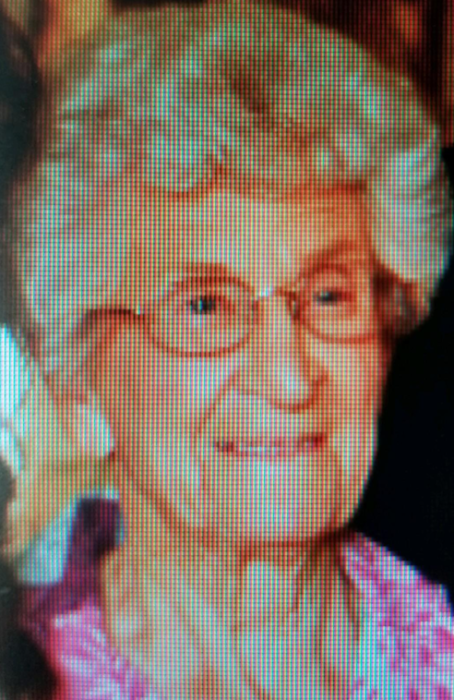 Doris Angelo, age 90, passed away at South Lincoln Nursing Center, in Kemmerer, Wy on Saturday, July 28, 2018. She was born on July 9, 1928 in Raymond, Idaho, the daughter of Morris and Lola Bowen. She married Joseph Augustine Angelo on July 13,1946 in Randolph, UT. Doris loved to cross stich, and was an excellant homemaker. She loved to spend time with her husband, and family. Doris was a wonderful Wyoming Cowboy fan, and loved to travel to watch sporting events with the Wyoming Cowboys. She is survived by her daughter, Linda Hahn of Kemmerer, Wy. ; her grandchildren, Jimmy(Dana) Hahn, Shane (Lynnae)Hahn, Michael Angelo, Jodi (Jerry)Thurston, and great grandchildren, Brighton Kenny Hahn, and Shayla Hahn, Bayley Angelo, Laramie Angelo, and Brook Angelo, and a great granson, Damon Thurston. She is preceded in death by her husband Joseph, a son, Joseph August Angelo III, her parents, two brothers, Robert and Ray Bowen, and a sister, Mary Kirkwood. Viewing will be held on Wednesday, August 1, 2018 from 6PM until 8PM at Ball Family Chapel, and funeral services will be conducted on Thursday, August 2, 2018 at 11AM at the Berta Penny United Memorial Methodist Church in Kemmerer, Wy. Interment will be held at the South Lincoln Cemetery, Kemmerer, WY.